Fall is here! Bring on the pumpkins! Wondering where to take the kids to a pick out the most awesome pumpkin and to snap some sweet fall family photos? 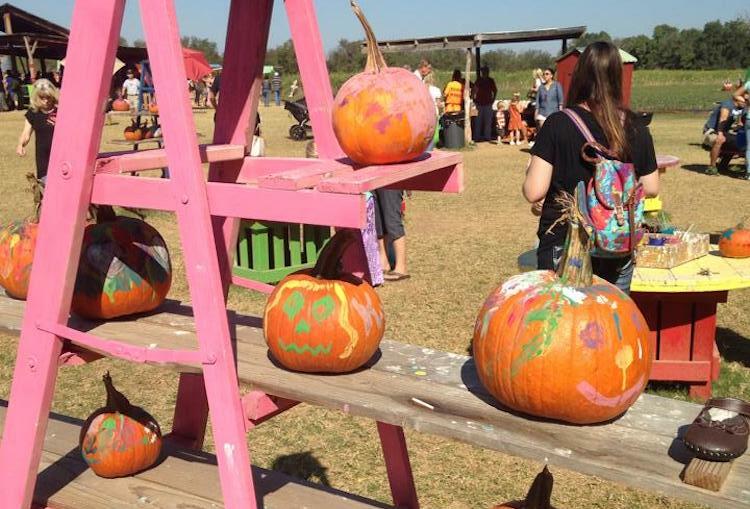 Here’s our annual round-up of favorite pumpkin patches around Austin! 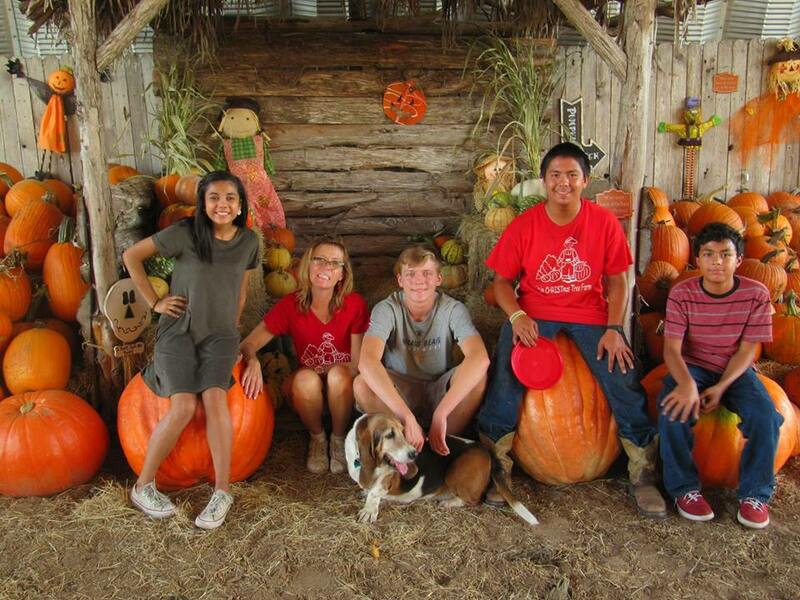 The annual Fall Festival & Pumpkin Patch in Bastrop will be open weekends from September 29 through Nov. 4. Visit on Saturdays from 10 a.m. – 7 p.m. or Sundays from 10 a.m. – 6 p.m. You can also plan a bonus visit on your Columbus Day holiday, Monday, October 8 from 10 a.m. – 6 p.m. Every weekend, you and the kids can get lost in a corn maze, play on a giant jumping pillows, enjoy barrel train, games, live music, farm animals, concessions, and of course, pumpkins, too. Kids ages 0-2 are free with adults. *Click here to read more about Barton Hill Farms! The farm will be open every day from October 5-31 for October Fall Fun. For $8 (for ages 2 & up), you get access to a hayride, train ride, animals to visit, mazes, playgrounds, picnic areas, pumpkin photo ops and pumpkin decorating (with pumpkin purchase). Their Pumpkin Festival will take place on Oct. 13, 14, 20, 21 (Saturdays from 10 a.m. – 5:30 p.m. and Sundays from 12 – 5 p.m.), and admission is $8 for kids ages 2 – 12 & $10 for 13 & up. Enjoy tasty food concessions, paint pumpkins, go on hayrides and more during these special weekends with a festival atmosphere. In the month of October, every Saturday from 10 a.m. – 5 p.m. and every Sunday from 1 – 5 p.m., Evergreen Farms in Elgin will be open for the Pumpkin Hunt where admission and parking are free. Customize your own experience on the farm where you can choose which activities to purchase such as the premier “hunt” that includes a wagon ride into the Christmas tree fields where mini pumpkins are hidden in the trees. There are also other activities like a pumpkin launcher, pumpkin maze, pumpkin golf, bounce house and more. Most activities cost $2.50 each, and a fire truck ride around the farm costs $5. 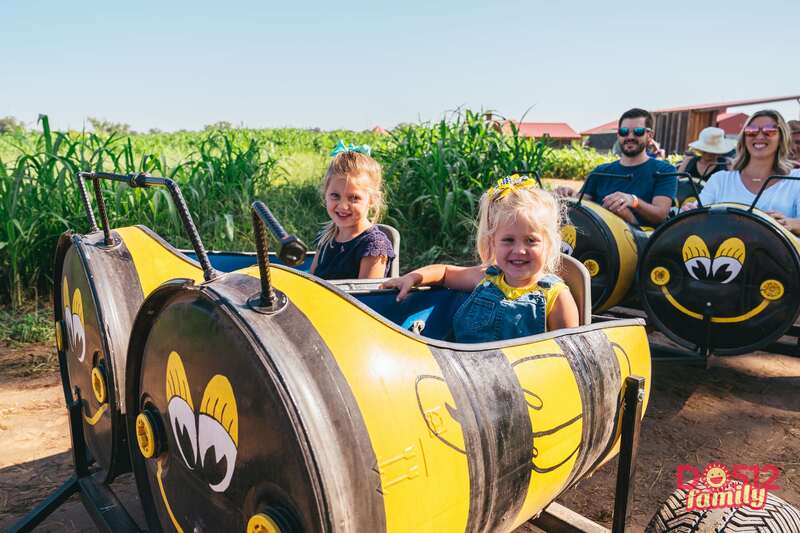 This Marble Falls farm offers the Harvest of Fall Fun, open from September 22 – November 4 from 8:30 a.m. – 5:30 p.m. on Saturdays and 11 a.m. – 5 p.m. on Sundays, and take note that they are closed every Wednesday. Admission and parking are free! You can simply just pay for the activities you want to do or the pumpkins you choose. Activities include hayrides, a train, a maze, sand art, horse rides, stuff a scarecrow, face painting, giant jumping pillows and homemade ice cream made with the goods from the farm. Prices for activities range from $2.50 – $5. More info on pricing (and coupons!) here. 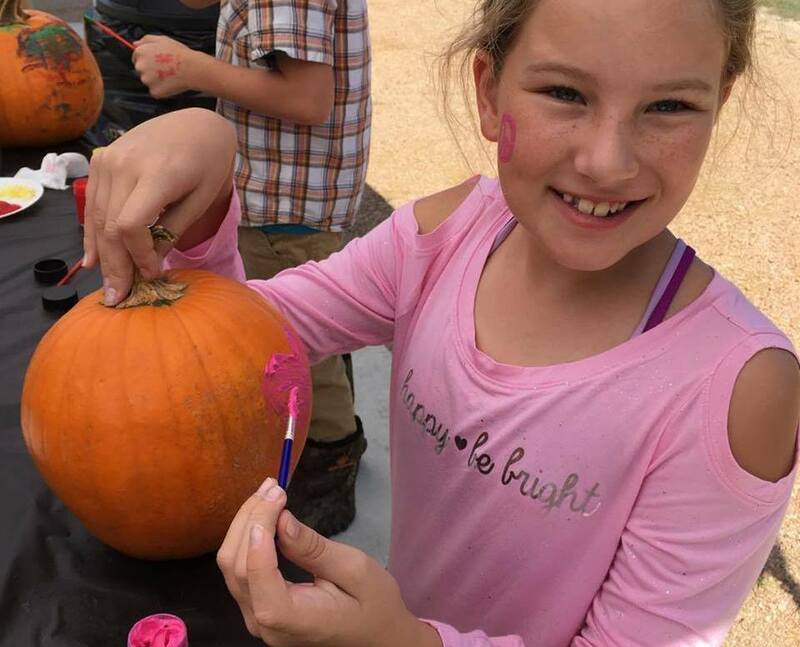 This Pumpkin Patch in LaGrange is open Monday – Friday from 10 a.m. – 6 p.m., Saturday from from 9 a.m. – 6 p.m. and Sunday from 1 – 6 p.m. Every Saturday in October you can enjoy free pumpkin painting from 10 a.m. – 12 p.m. with a pumpkin purchase. Here you’ll find pumpkins, squash, gourds, decorative corn and corn stalks. Families can also take a tour of the farm which includes feeding animals, milking a cow and a hay ride. Click here for hours and fees for the farm tours. 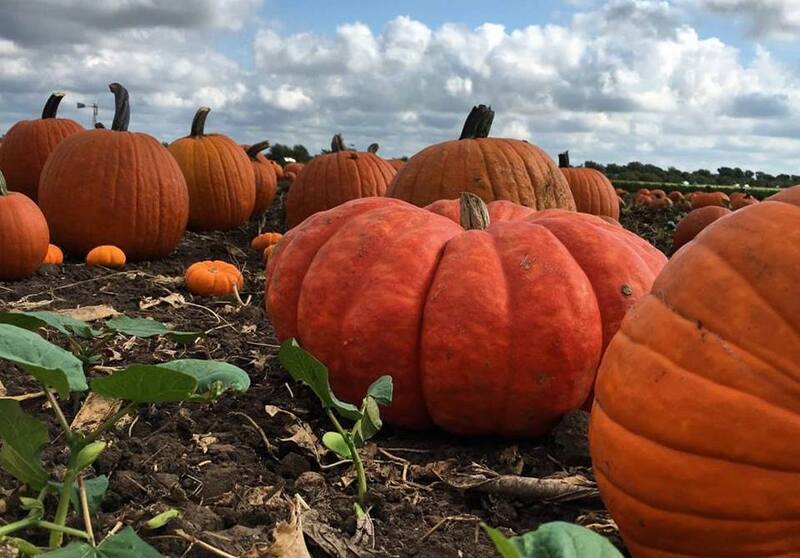 Take note that on Nov. 10 the Jersey Barnyard is hosting the The Great Pumpkin Run Texas 5K that’s paired with a Fall Farm Festival packed with activities. Click here for registration details. This family-owned farm in Temple has a Pumpkin Patch that’s open on Saturdays & Sundays from 10 a.m. – 6 p.m. from September 22 – November 4. You’ll be able to pick pumpkins and enjoy activities such as a corn maze, hay rides, arts & crafts, animals to visit (such as baby goats). No admission or parking fees, but a $10 wristband gets you unlimited turns on the fun activities. 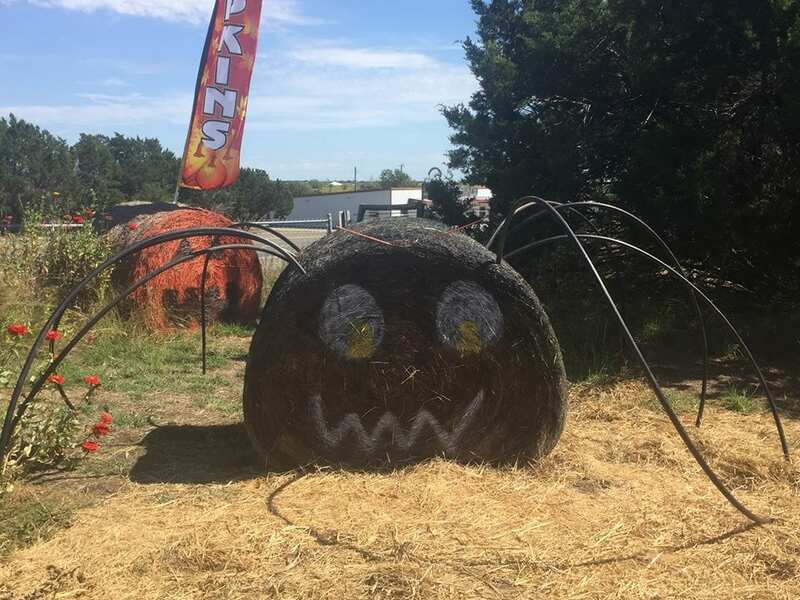 Located in Bertram, TX the Texas Big Worm Pumpkin Patch is open from September 28 – October 28 on Fridays & Saturdays from 9 a.m. – 6 p.m. and on Sundays from 10 a.m. – 5 p.m. Enjoy free admission and parking. Simply choose which activities you wish to pay for such as hayrides, pumpkin painting, feeding animals, and plenty of fall fun. 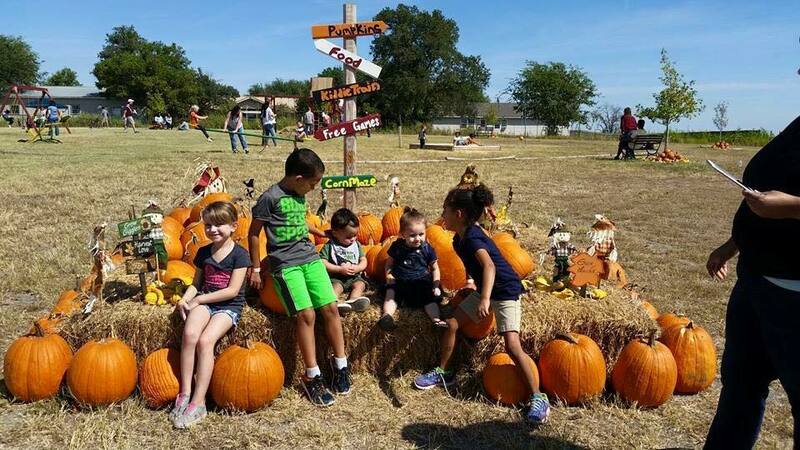 A relatively new pumpkin spot in Bertram, TX, Nomad Ranch invites the family to come pick a great pumpkin from their patch and enjoy a family hayride, pumpkin painting, face painting, and kid-friendly hay maze. Plus, you can feed their cows while you’re there, too! They are open from Oct. 12 – Nov. 6 from 10 a.m. – 6 p.m. daily. Admission and parking are free. 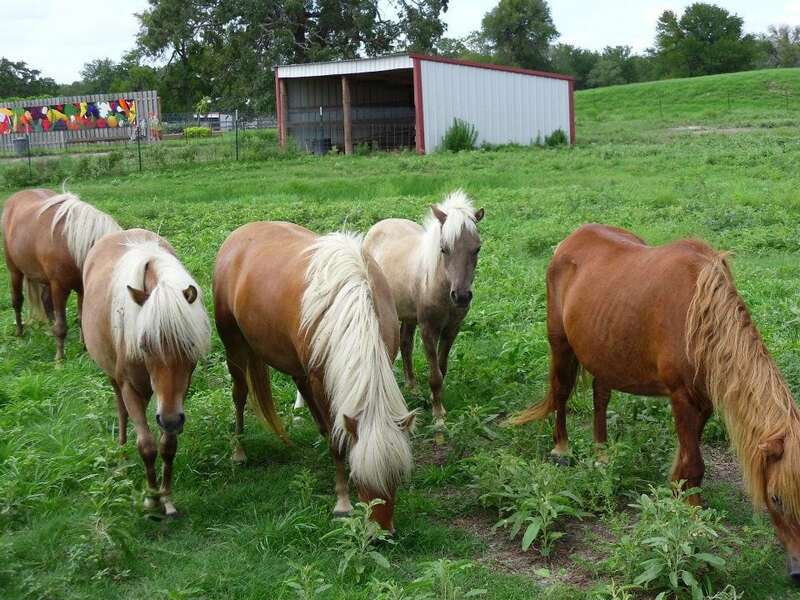 This farm, located in Manor, offers Fall Family Fun Days each Saturday in October: the 6th, 13th, 20th, and 27th. In addition to pumpkins, there will be lots of local vendors selling everything from fresh organic produce, eggs, honey, jam, and bread, to a variety of hand-made crafts, plus lots of special events, like raptor shows, snake lessons, a corn and potato cannon booth, and much more. Admission to the farm is $9 per adult, $7 for kids ages 3-12, $3 for 2-year-olds, and free for children under 2. Last but not least, this pumpkin patch and corn maze is a couple of hours away on Graff 7A Ranch in Hondo, Texas, but it is huge and worth noting. The season is open from September 22 – November 25, 2018. South Texas Maize is open for Fall Fun on Friday evenings from 6 – 9 p.m., Saturdays from 10 a.m. – 9 p.m. and Sundays from 12 – 5 p.m. 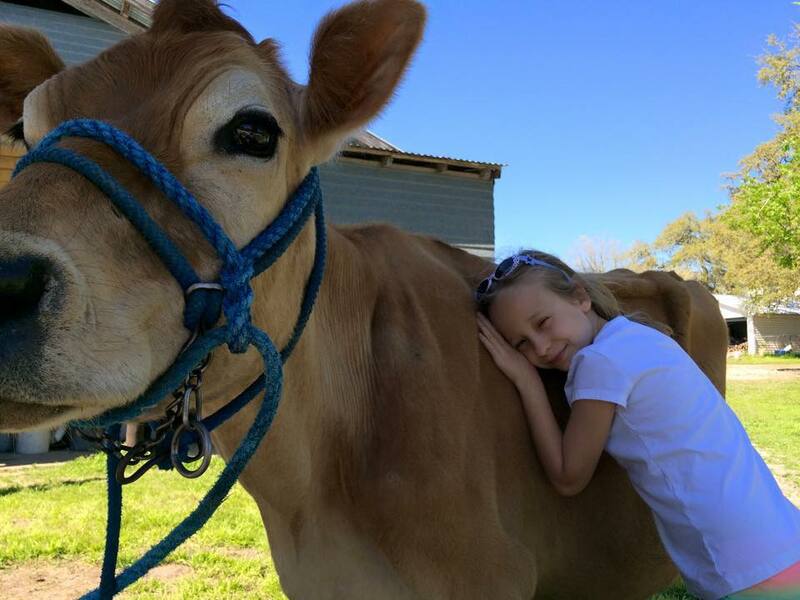 Admission is $13 for kids and seniors and $17.95 for adults, which you can purchase online here, and this includes unlimited jumps on their bounce pillows, a cow train, a worm slide, a goat walk, campfires with s’mores, hayrides, and more. –> MUCH MORE! Looking for more great Pumpkin Patches? Lots of local churches offer a wonderful selection of pumpkins. Click here for an even bigger Roundup of Pumpkin Patches in Austin in 2018! I'd like to introduce you to the good people of St. Richard's Episcopal Church and the incredible pumpkin patch that's been quietly gaining speed. It is now one of the largest int he country. They anticipate selling six truck loads of pumpkins, the proceeds of which support local and international relief and caring ministries like the Round Rock serving Center, Nets for Life, and Five Talents. Patch opens this Saturday! On Sunday Oct 19 2:00 pm-6:30 pm we throw a huge party with bounce houses, trunk or treats, the Lost and Nameless orchestra, petting zoo, pony rides, traders and more to say thanks to Williamson and Travis Counties for buying pumpkins from us and helping us increase our capacity to support others! It's an easy way for Families to make memories! The King of Kings pumpkin patch opens on October 12th, not the 2nd, at 3:00 p.m.
We are open October 13th - 31st from 9:00 a.m. to 8:00 p.m. (we have limited staffing on week day and Sunday mornings, during these times individuals are asked to make payments in the church office). If you have a group who is interested in coming to the patch as an activity please contact Sarah Britton at the church office (512-255-0829). Proceeds from go to support the youth and service ministries of King of Kings. And our pumpkins grown in Texas! Are any of these places dog friendly? We're not entirely sure about taking dogs. Best bet is to call the pumpkin patches that you're interested in directly to inquire.